You know, at this point in the game, I might have reviewed more Dark Horse books than any other. I’m cool with that! Trine Hampstead knows the answers to your questions and the solutions to your mysteries. She does not know how she received these powers, but she has them, and some folks are not happy. As of late, I’ve been contemplating the power of being able to know the answer to every single question, no matter the topic or subject matter. At first, it sounds great…Super Bowl scores; lottery numbers; cures for diseases; etc. But, the longer one thinks about it, the more the mind slips into questions like “When will I die?” or “What does this person really think of me?” And unless you could turn it off, it would end up being a curse. A curse that could solve the world’s problems but still a curse. 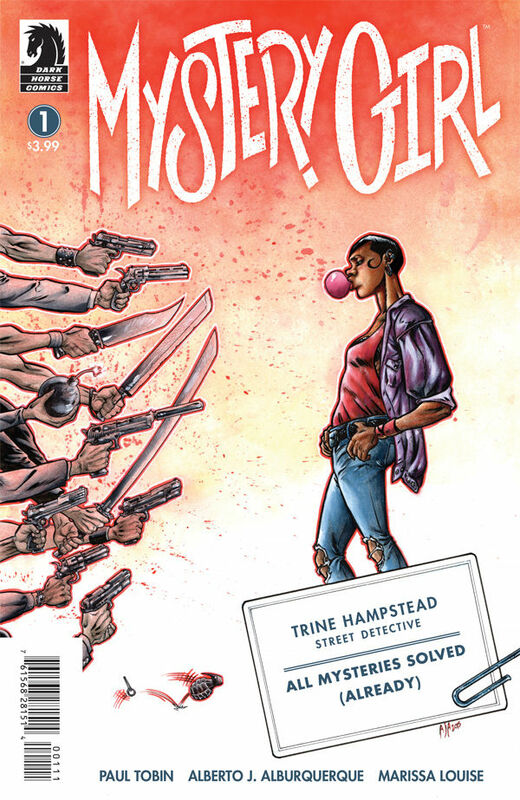 Not long after I started contemplating this scenario, Ronell Whitaker handed me a copy of Mystery Girl, and around that time I also discovered Huck from Image Comics; both stories revolve around a protagonist that knows answers with no real explanation as to why they know what they do. Neither Trine nor Huck seem to be plagued with the ability to know the answers to every question ever, but they do rely on their ability to know things to push the plot forward. The collective unconscious is a thing, and we are moving into a time in fiction where see-ers are featured. I’m in. It’s a cool concept! 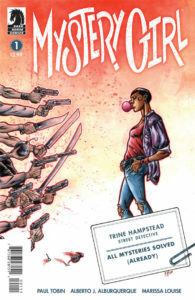 Mystery Girl is a solid Book One. We get to know Trine, her powers, see her in action, but we don’t get it all. Our creative team leaves some questions unanswered, and as I’ve spoke about in the past, the ability to close some doors before ending trade one while leaving the right ones open, tremendously helps in creating Book Two readers. The art is cool. It has an Image Comics Chew quality to it. Not as cartoon-y, but fun and funny. However, the story is the hero here. If you dig Trine and the exploration of who she is and what she can do, you will be back for more.